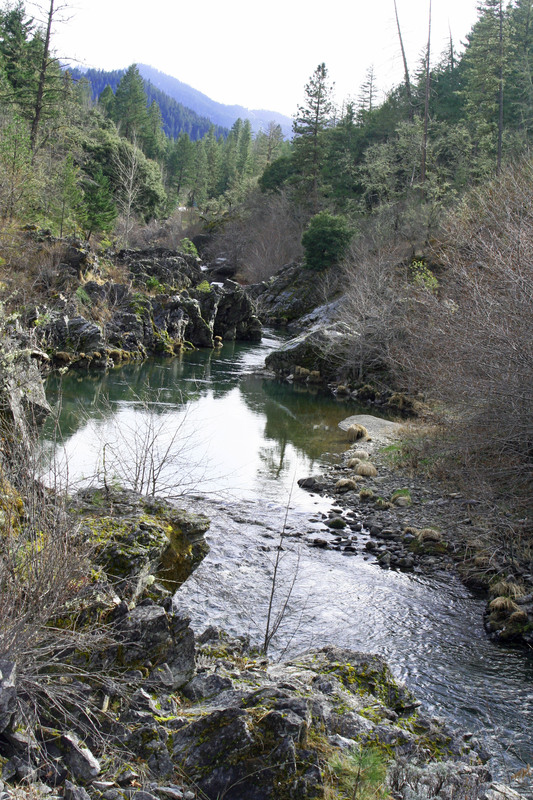 The beautiful Applegate River in southwest Oregon is know to be Bigfoot Country. This photo is taken just down from our house at around 2000 feet elevation. Several sightings have been made near the Oregon Caves National Monument, about 15 miles from where we live as the crow flies. The most famous involved Matthew Johnson, a psychologist from Grants Pass Oregon. He heard guttural sounds, smelled something pungent, and then saw Bigfoot hiding in the trees some 60 yards away. He was spying on Michael’s family. They made a quick exit. The story has received widespread media coverage since the July 2000 incident. LP, a former army MP and English teacher who is now a policeman, relates seeing Bigfoot even closer to our house. He was staying in a friend’s home on the Redwood Highway just after it crosses the Applegate River. One night, he heard his friend’s dog “go ballistic” and went outside to see why. He saw a large creature crouching in the grass. “What the F ***…” he thought. “I saw the HUGE THING take off in a full BIPEDAL RUN.” LP admits to being more frightened than he had ever been in his life. He went inside and got a big gun. 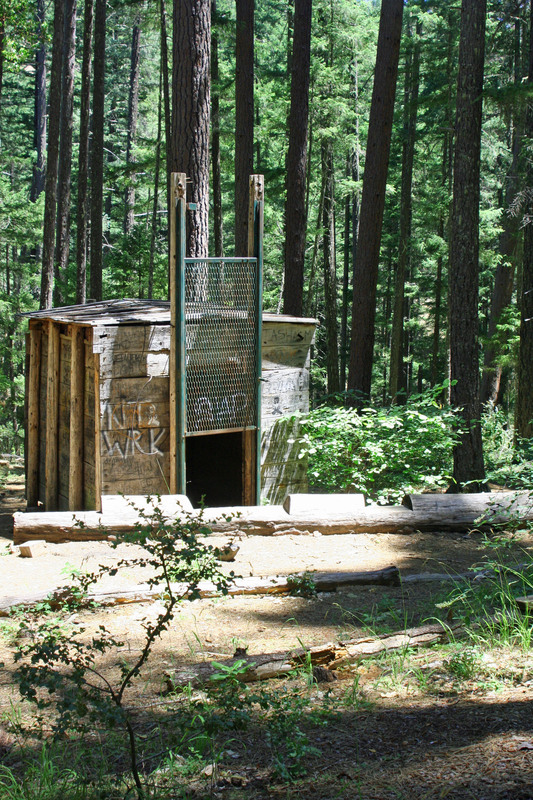 Given the local interest in Bigfoot, Peggy and I decided to spend July 4th checking out a well-known Bigfoot site… the only trap ever built to catch the large fellow. It is located four miles from where we live on a small, seasonal creek that flows into Applegate Lake. The story starts with Perry Lovell discovering 18-inch human-like tracks with a six-foot stride in his garden near a stretch of Applegate River that became Applegate Lake. Ron Olsen, a Eugene based filmmaker who headed up a group called the North American Wildlife Research Team, decided to catch Bigfoot so he could be studied. In 1974 he built a sturdy 10 by 10 foot trap with a metal grate door near where Lovell had lived and baited the trap with fresh meat. A local miner was hired to hang out in a cabin near the trap. He was given a tranquilizer gun and large handcuffs. I would have included a barrel of whiskey. The trap worked. They caught a couple of bears… but no Bigfoot. After six years the idea was abandoned. 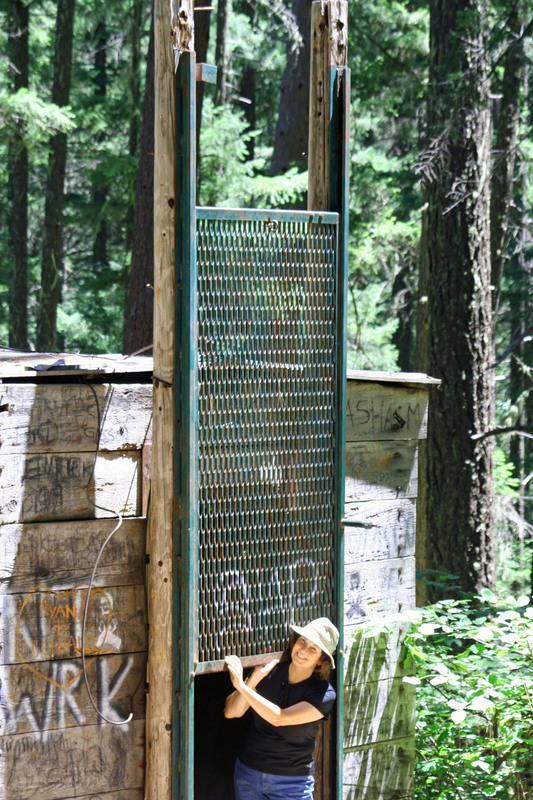 In 2006 a group of volunteers working with the Forest Service restored the trap but sealed the door to protect the public. Peggy and I drove the three miles up to the Collings Mountain Trail, which is on Applegate Lake just beyond Hart-tish Park. A big foot painted on the trail sign let us know we had arrived. A short and pleasant three-quarters of a mile walk up the seasonal creek took us to the ruins of the old miner’s cabin and then up the hill to the trap. 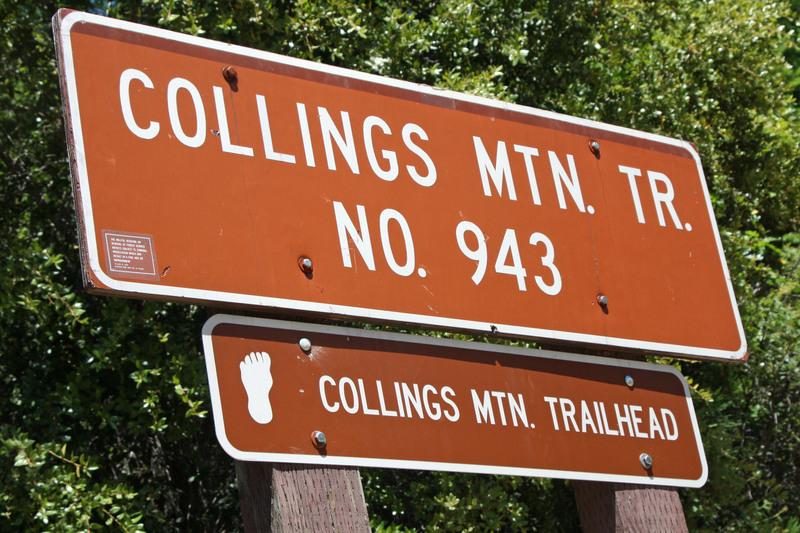 A big foot on the Collings Mountain Trail sign lets you know that you have found the right path to the Bigfoot trap. Even if we hadn’t been on a mission to find the Bigfoot trap, the pleasant stroll along the shaded path would have been worth the trip. 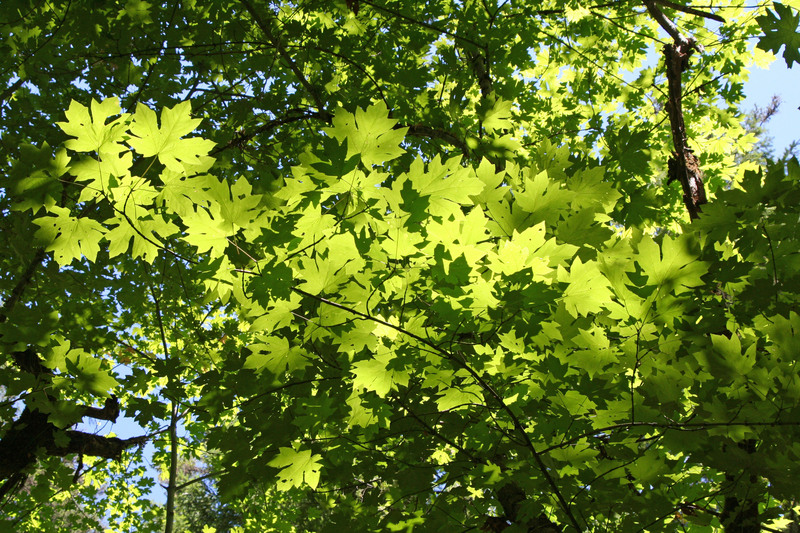 These are maple leaves backlit by the sun. Towering Douglas Fir also decorate the Collings Mountain Trail on the way to the Bigfoot trap. 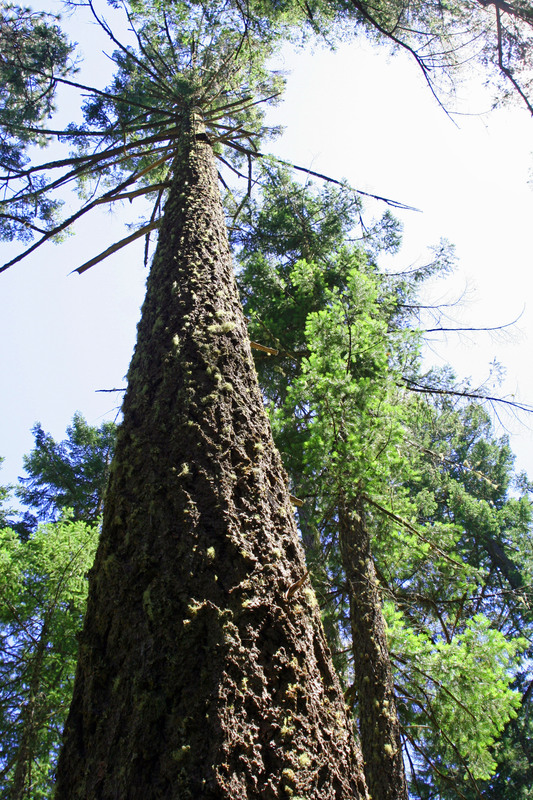 Douglas firs are second only to Redwoods in being the world’s tallest trees. 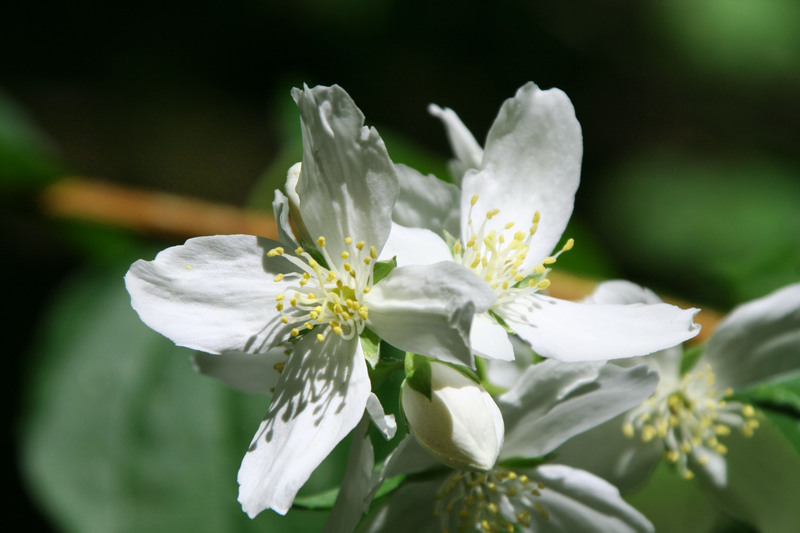 If you spend much time wandering through the lower forests of Northern California or Southern Oregon, you need to recognize this plant. 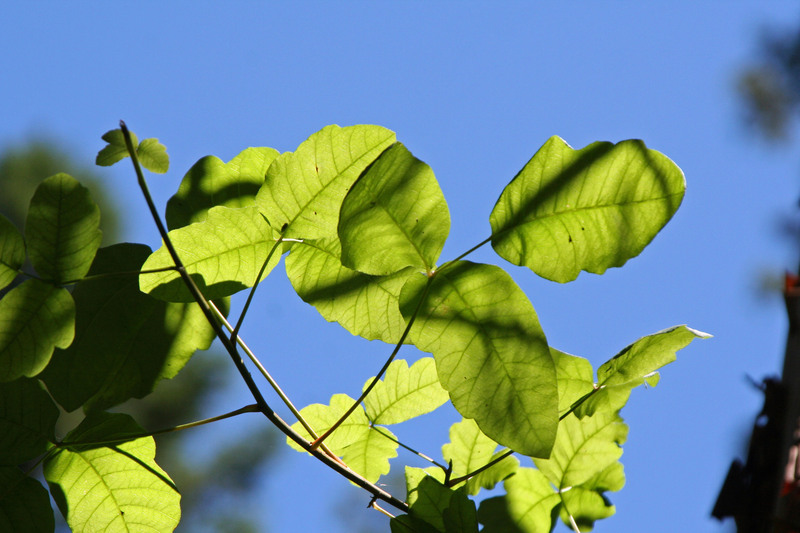 It is poison oak. Our hike to the Bigfoot trap included enjoying the flowers along the way. This was fun. The path to the Bigfoot trap follows a seasonal creek that still contained small water holes. 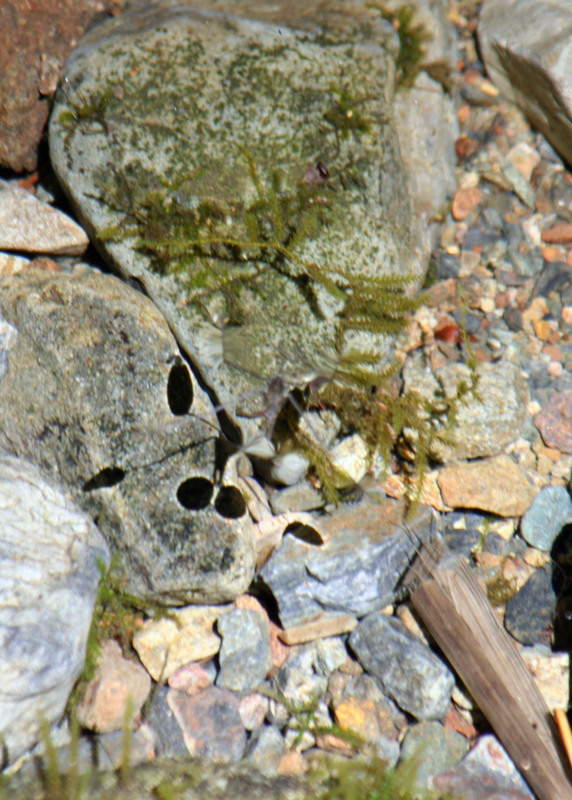 What you are looking at is the shadow of a skipper or strider, a small insect with long legs that strides or skips across the water. They are incredibly fast. I am shooting down into the water. Look carefully and you can see the bug located near the right front foot shadow. A miner was hired to monitor the Bigfoot trap. He was given a tranquilizer gun and large handcuffs to subdue the big guy when he got caught. 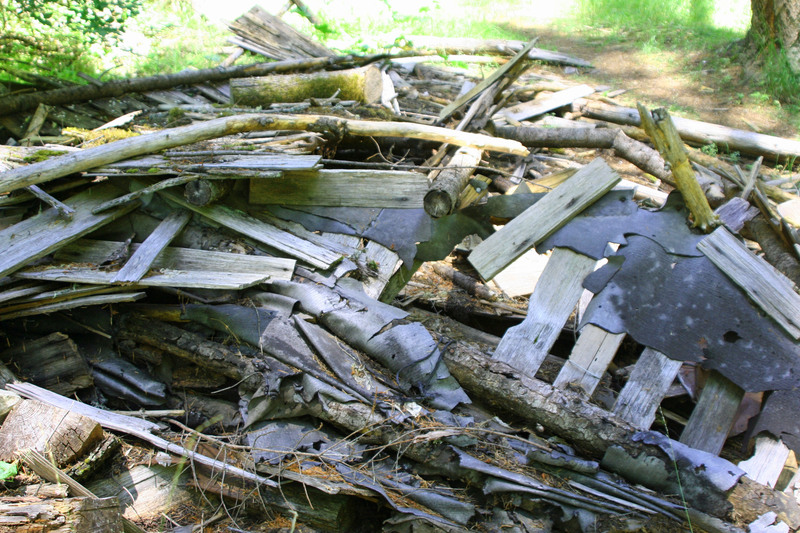 This is all that remains of the miner’s cabin. As reported, the Bigfoot trap is large and sturdy. It is also covered with graffiti. Too bad the trap is inoperable. I would have baited it with a spray paint can. It would be much easier to catch a miscreant teenager than Bigfoot. 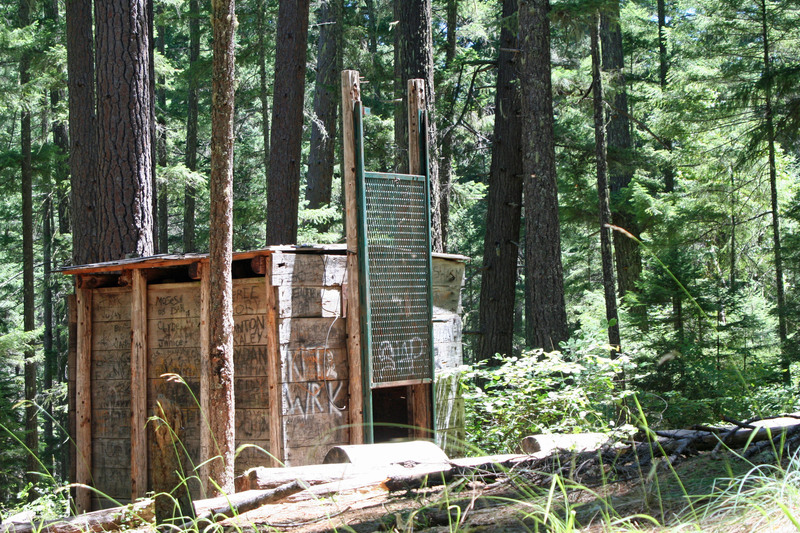 The graffiti covered Bigfoot trap located in Southern Oregon near Applegate Lake. It is now permanently sealed open. My wife Peggy provides a perspective on the size of the trap and the trap door. 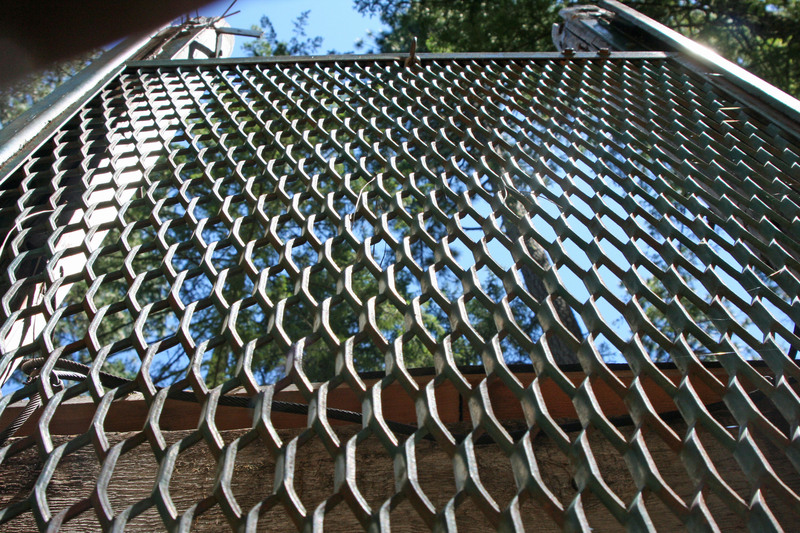 Looking up at the metal grate door designed to capture Bigfoot. Back home I looked up the Bigfoot Field Researcher’s Organization (BFRO) on the Net. It’s worth checking out. The site describes hundreds of North American encounters by region. And it also describes Bigfoot characteristics. They weigh up to a thousand pounds, like to make whoop, whoop sounds, and throw rocks at people. What do I believe? Definitive proof would be nice. I’ll remain skeptical until I meet one but I would love to make one’s acquaintance as I wander through the woods of Northern California and Southern Oregon. Here’s one final encounter I discovered in the Rensselaer Republican, a newspaper my great-grandfather George Marshall published out of Rensselaer Indiana on February 7, 1902. Residents of the little town of Chesterfield in an isolated part of Bannock County, Idaho are excited over the appearance in that vicinity of an eight-foot, hair covered human monster. He was first seen on January 14 when he appeared among a party of young people who were skating on the river near John Gooch’s ranch. The creature flourished a club and started to attack the skaters but they reached their wagons and got away in safety. Measurement of the tracks showed the creatures feet to be twenty-two inches long and seven inches broad, with the imprint of only four toes. Stockmen report having seen the tracks along the range west of the river. The people of the neighborhood, feeling unsafe while the creature is at large, have sent twenty men on its tracks. A final view of the Bigfoot trap. Given how clever Bigfoot has proven to be at avoiding people, I think the only way this trap could have caught him is if he had fallen down laughing so hard at the people thinking he would go in it. Great post and very timely! When I was in Orick at the burl shop, I noticed that the owner had old newspaper clippings about Bigfoot on his wall. The idea piqued my curiosity and I’ve been researching since then! Glad you posted this – made my day! Been by the Applegate several times. A really nice area with lost of back country. It has some really nice places to camp. Was also at the park just south of Cave Junction that is on the BFRO for a report sighting. Great article with even better pictures. This is the first time on your site Chuck, look good. Hey David, Thanks for visiting my post. And you are right about the area. I was born in Ashland but the family moved away when I was a baby. Prior to moving back here, my wife and I travelled for three years throughout the US looking for a place to retire. This area won. Question: What do YOU believe about Bigfoot? 🙂 Nice write-up. Fair question Mustang… I think there is a lot of evidence floating around out there. It puts me on the side of the believers. Still the evidence needs to be better. What is it about Bigfoot that allows him/her to be so darned illusive? Thanks for your thoughts, Curt. Since I deal with evidential matter, I find my “logical” mind (LOL) saying, “Where’s the remains with DNA,” or “Where’s a body?” But like any human being seeking truth behind tales (even mermaids), I do long to find Sasquatch truly exists. This is way out… grin: what if Sasquatch bury their dead? Really enjoyed this account… blurring between fiction and non?! Suspect so Jane regarding the blurring. There is supposed to be a real expert in our community who has reportedly seen one. He is a friend of one of our neighbors. I think it will make an interesting interview.